Hmmm, kind of looks like one half of a Scallop shell with the 'inside' bit facing up and the 'tail/join' end facing the camera. Looks suspisious to me ! I thought everybody knew that the Goron race lives in Mars and they're very healthy rock eaters. That is probably something one of them dropped while collecting an abundant amount with its bare hands and then taking it over to their home. It is well known that Mars is owned by the Wong Family, who have their buggalo ranch there. I said this on another forum section, the before pic has the same shape in it... as the rock... in the same place too! Iti isn't in the same place. The raised white object is actually close to the angle shaped delimitation than initially where a shape can be seen. it was something that grew and moved... In the same time the item is clearly raised than in the first pic because has gotten a shadow. Anyone noticing the same colour as one of another identical item raising from a rock ? It looks identical in composition. To my eyes that rock is clearly not there, and then is there. I tend to agree with the wheel thrown rock idea, but I had not heard previously that the rock was not native. That is an interesting point to think about. Those who say the rock is in both pics are going to have to draw me a picture, because I just don't see what they are talking about. Fill me in on this Goron race? It should be quite simple: if it is a real object (as it appears) and not some camera anomaly (which is doubtful), then have the rover go over and investigate it close up, assuming they have not done this already. Move it, do a spectral analysis, whatever the robot is capable of and at least that may tell up what it is, if not why it suddenly appeared. Nasa's explanation makes perfect sense, you can expect this rover to drive around Mar's and not have any impact on the surface, Its going to leave tracks, kick up dust and rock's depending on what type of surface its on. You park your car to the left side of a car park, leaving a gap on the right side. No matter how you see it, the car is still in that car park, even if it's overhanging the side a little. You can say 'look closely' all you want. Yes there is a little section on the lower right that looks like it may be the shape, that does not mean they are not in the same spot. Don't forget guys, this isn't curiosity but opportunity. Still like in all the previous similar sightings i would say to Nasa, get closer and take macro shots of the damn thing, don't resume to presumptions. A house wife can provide exactly the same assumptions. The rock wasn't there before since there is a shadow in the latest pic showing as well a different distance comparing to all other elements. 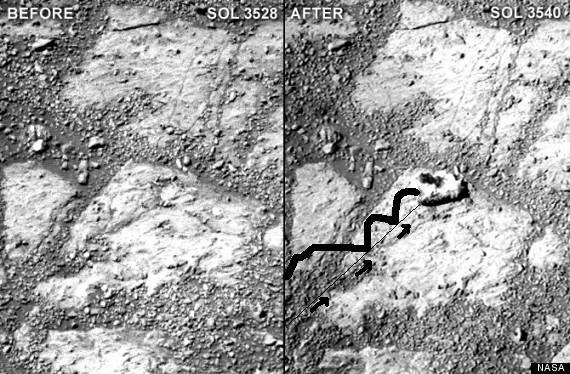 In the same time was not moved by the rover's well since all other amall rocks and grains are right there in both pics. I think they must have already used the Spectrum analyzer on it, because they said it does not have the same chemical makeup as the rocks around it. I'm going to need you to circle the rock in both of these pictures so I can know what you are talking about. A "dust devil", known to exist on Mars, surely would have kicked-up and thrown around the small pebbles. I accept NASA's view that this rock was thrown by one of the rover's wheel's. there are two stones sticked by the shadow of the embedded form. 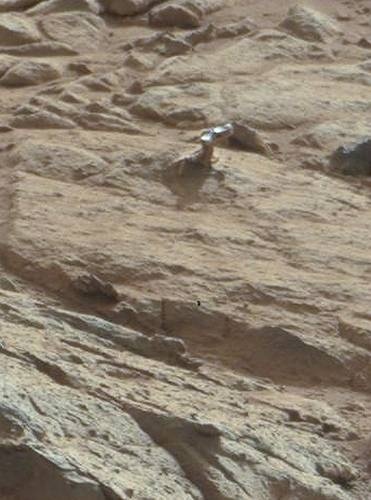 The rover would have moved those two rocks when pushing the stone. In the second pic (right) the small two rocks are just a bit distanced between eachother while the rock is totally separated. There are no other indications in the grains of the sand around the rock that would indicate the rock rolled from the rover . Any mediocre analysts would say that rock hasn't been moved by the rover and no other grains from the soils have been affected which is impossible if the rover would have caused a stir. You are wrong, they are offering a childish explanation. Like many others so far. 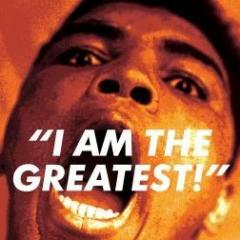 It takes a child to believe ! Since when have NASA engineer's been other than extraordinary? since they started making assumptions instead of analyzing real facts utilizing the equipment supplied. I thought it is their job to "utilize the equipment supplied" and then make assumptions, based on their mission objectives, of course. Maybe an alien threw the rock lol. The rock flew in from one of the wheel locations and ended up where it is now. how come then , there's no indication of such slide or jump? You can clearly see all the small rocks or grains existing in identical position in both pics. How then did it jumped over all these landing exactly where it seats now, even more without disturbing ll other small rocks around. ? It' s called a "jump"
Nothing special or unusual, given the circumstance.